Email has been a staple in the marketer’s toolkit as long as email has been around, and it’s showing no signs of giving up that spot. That’s because email has been, and is predicted to consistently continue as, one of the strongest channels for engaging and converting audiences. 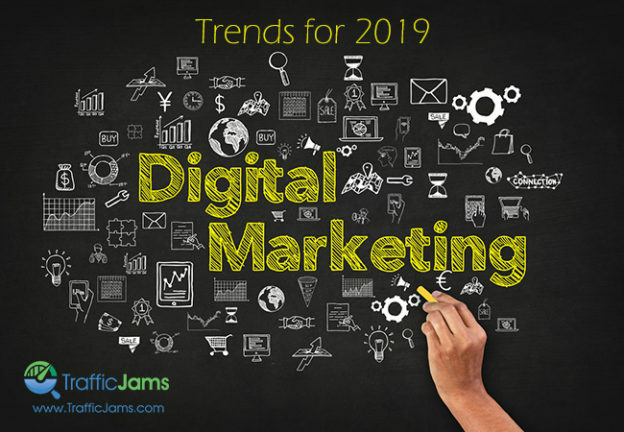 But despite the advances in technology, graphics and mobility, the formula for a successful email marketing campaign has stayed largely the same. Certain best practices stay constant throughout the years and guarantee a higher success rate. We’ve listed a few below. Your email is a waste of time and resources if it isn’t opened. 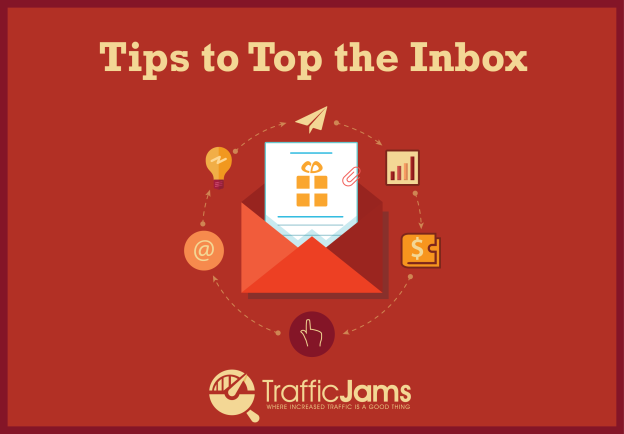 There are a few things you need to do to top the inbox and it all starts with your subject line. While it should pertain to your email, it should also catch the reader’s attention. We never support click-bait; a subject line that convinces a reader to click then has nothing to do with the message will most likely alienate you from your target. At Traffic Jams, we ask ourselves, “What is it about this message that is enticing to the reader?” Maybe it’s a special offer or a solution to a problem. We use that to our advantage when creating a subject line. Email is popular because it’s convenient and it’s fast. If your reader opens a 500+ word email, they’ll skim it at absolute best. Successful emails state their objective right off the bat. They tell the reader what they’re about and most importantly, why they should care. They do it clearly and concisely to keep the reader’s attention. We don’t answer phone calls from unknown numbers and we don’t read emails from unknown senders. Instead of buying your email lists, build it up from existing clients and referrals you do have. Use your brand identity to connect the reader with your email’s objective. As you reach out to prospective clients, make the interaction as personal by conducting research to ensure your list is as close to target as possible and including names when applicable. The average person is inundated with emails every day. Most of us immediately delete the majority of mail that comes our way, especially if we don’t think it relates to us. As a marketing tactic, emails can be tricky. They require a strategy and plan to be successful and an accurate analysis of your target audience is key. Still, getting consumers to open your mail can be difficult. Getting that click-through can be even more difficult. It’s frustrating to put effort into an email without definitive results. If you’re not experiencing the results you anticipated, there are many things you can do to your emails that have big impacts on your click rates. Let the reader know exactly what the email is about in an engaging way. There is research to indicate that “this specific amount” of words is optimum for a subject header in an email, but the main goal is to attract the reader’s attention however necessary. This can be done by using unique word choice or by including concrete numbers like 7 or 15 to break up messages and catch the reader’s eye. Tell the reader what they are going to learn or gain by opening the email right off the bat. Presentation matters. Make sure your email’s format is friendly across all platforms. Almost half of all emails are opened on a mobile device, so it’s absolutely necessary to create emails visible on a smartphone or tablet. Consider some simple mobile design tips, like increasing font size and creating an obvious call-to-action. Edit and re-edit your emails for grammatical and formatting errors as these mistakes hurt the email’s credibility amongst an inbox full of mail fighting for attention. Be clear and to the point. Make sure the purpose of your message is clearly received. Make sure that your emails are only sent if there is real benefit to the reader. Offering incentive or benefits strongly increase your chances of clicks and demonstrate your relationship with the email recipient. Avoid clutter by making your content quick and to the point. Short and personal emails give you a clear and concise voice. Make sure all information necessary is included and the call to action reminds readers of why the email was sent to that specific person. Know the habits of your audience to most effectively reach them. Your audience determines your language, your timing, the format of your email and a lot of other things too. Knowing their habits is necessary before using any other tool to construct your emails. When are they most likely to check their email? Typically, the most common time an email is opened across the board is after 8 p.m. on a weekday, though this may vary depending on your audience’s demographics. The type of language used in your email should be reflective of the purpose of the email, and the way you would talk to your target audience. Retailers marketing to teens are going to fill their subjects with tones much different than IT companies marketing to small businesses. Addressing your audience appropriately creates a personal relationship with viewers and incentivizes clicks and opens. Everyone’s inbox is cluttered and overflowing. There is no definitive formula for email marketing success. 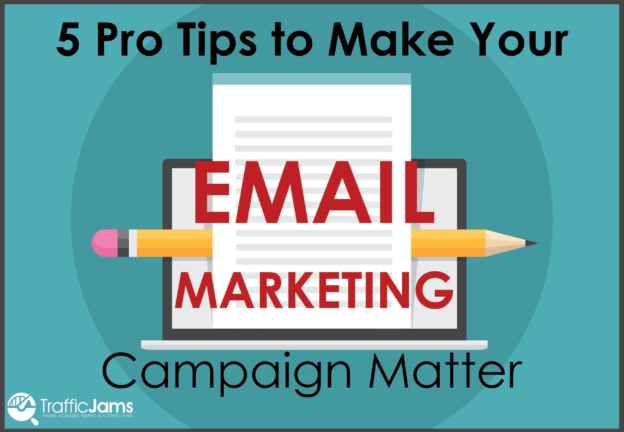 However, by catering to your audience’s needs in the most appealing ways possible, your email marketing campaign has the ability to grow and succeed. 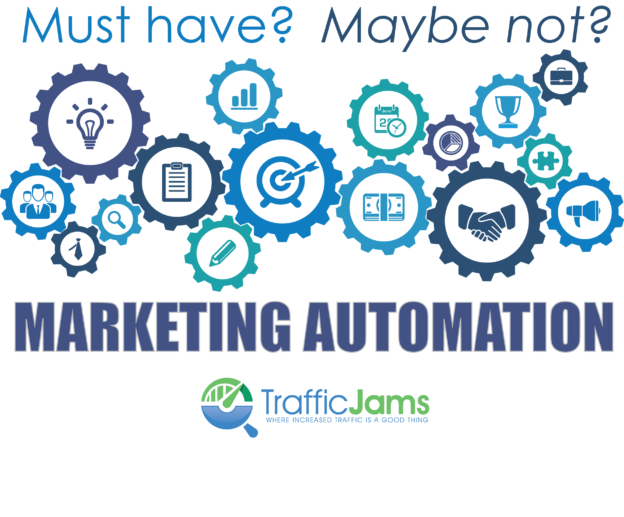 If you’re looking for additional help, contact our marketing experts at Traffic Jams by calling (855) 599-9998 or emailing sales@trafficjams.com. We can create an email marketing campaign that is sure to produce results. This entry was posted in Email Marketing on March 9, 2016 by Becca Crook. When digital marketing experts speak of a digital marketing campaign, often times they only touch on factors like social media, SEO, and building a reputation on the Internet. Another important digital marketing strategy is using email marketing to your benefit. 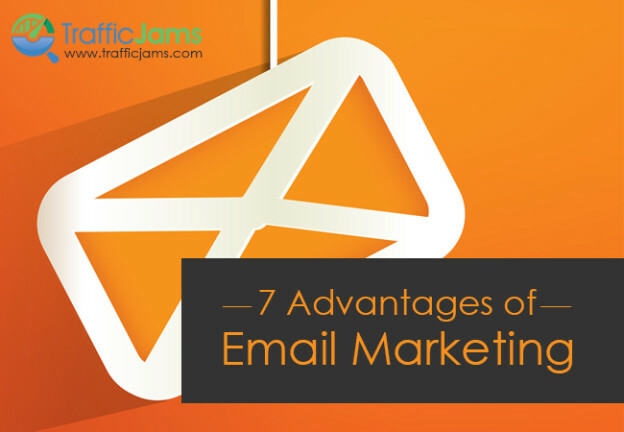 Here are 7 reasons email marketing should be a part of your cohesive SEO plan. Simple to develop: Perhaps the most important benefit to email marketing is that email campaigns are simple to develop. Once an idea for a sale or newsletter comes out, it can be put into action within minutes. Not only are the emails quick to develop, but they’re easy to develop as well. Using email marketing applications allow you to develop an email in a visual way so that you see what is going out before it actually is launched. Additionally, these email marketing software clients offer ease in reporting email marketing campaign results as well. Lower cost: Did you know that email marketing is about 20 times more cost-effective than using traditional media to deliver the same message? With email marketing, you eliminate costs of both postage and printing. Additionally, people are far more likely to just toss direct mail into the trash, while email marketing shows a far greater ROI (return on investment). You spend less, and get more customers. Wider reach: Many businesses, whether they are B2C or B2B, serve national and even global markets. Advertising to these markets via traditional media is not only expensive, but difficult in general. With email marketing you have a global reach at your fingertips. You can send emails to people in specific cities, states, or even countries, widening your opportunities. Targeted marketing: Not only do you have a global reach with email marketing, but you also have the option to target specific groups of people. You have the ability to choose only subscribers to your brand, or people of specific demographics including age range, location, gender, and even profession. Instead of sending your call-to-action to people who will simply ignore it, you can increase your ROI by launching email campaigns tailored specifically to people who want to buy your product or service. Personalized Messages: There are approximately 2.5 billion email users around the world. That is about 35% of the world. These users check their email daily, and begin to expect emails from their favorite service providers or product sellers. You develop a relationship with those that receive your emails, and have the ability to personalize the message that is sent to them. Good examples include using (but not over-using) consumers’ names and sending them reminders that something is still in their cart and ready to be purchased. The better the relationship you develop with your consumer, the more likely they are to trust you. The best part of all? Deeper relationships lead to higher profitability. Advanced tracking capability: When you send off direct mail, you often times have no idea who reads your call-to-action and who simply tosses it into the garbage. The only tracking mechanism available is asking inquirers how they found your product, and using surveys that usually don’t offer 100% concrete information. With email marketing, you can track who clicked what, which email subjects are opened, and even who unsubscribed because of that specific email. It allows you to implement trial and error so that you can eventually find your “secret potion” or “the perfect email”. Drive more sales: It’s already apparent that email marketing offers a greater ROI than traditional media, but did you know that approximately 50% of online users bought a product or service as a result of an email? This is a higher percentage than any other traditional or digital outlet, and proves that without email marketing you are losing out on a large amount of potential sales. This entry was posted in Email Marketing on March 24, 2015 by AngieM.